Currently soy is the only dairy-free yogurt that provides a significant amount of protein and until now they all contain a substantial amount of added sugar. Silk's new plain yogurt has a minimal amount of added sugar and provides 6 grams of protein per serving. It also contains live cultures just like traditional yogurt. Silk has been recognized as a leader in sustainable agriculture and is the largest purchaser of non-GMO soybeans, something the dairy industry can certainly not say. In the Western world soy has become somewhat of a controversial food and part of a complicated issue. The common concern related to soy consumption is its high levels of specific isoflavenoids called phytoestrogens. These molecules are biologically active and have similar structure to the hormone estrogen. It is scientifically accepted that over exposure to estrogen can increase risk of certain cancers and some fear induce premature development in girls and unwanted development in males. Much of the confusion originates form studies done on rats which saw increased tumor development with a diet high in isoflavenoids. However, rats metabolize these phytonutrients differently than humans. Rats do serve as a very important model in laboratory research. However, not all observations can be applied to humans, such as this case. In fact, when the consumption of soy and disease rates are compared in humans, it has been found that people with the highest intake of soy have significantly lower rates of all chronic diseases, even breast cancer. As for early or unwanted breast development, the amount of soy that would have to be consumed would not be recommended under any circumstances. Another concern people have is they believe all soy is highly processed and genetically modified. There are definitely many processed soy products on the market and these products should be avoided because they are processed not because they contain soy. It is also true that most soy is genetically modified. However, this soy is used to feed livestock, make bio-diesel, and highly processed foods. Soy products such as tofu, miso, tempeh, soy milk, soy yogurt or edamame are going to be organic. There is no market for GM soy milk for example. Westerners should not be villianizing this protein source. Instead they should be looking for ways to increase their intake of soy products. This plant food provides high quality protein, micronutrients, phytonutrients, fiber (depending on the product), is low in calories and are without question an ally in disease prevention. Also something the dairy industry can not say. Add nuts or seeds such as walnuts, almonds, chia seeds or pumpkin seeds for different combinations of essential vitamins, minerals and phytochemicals. In addition to complex carbohydrates, protein and micronutrients, nuts and seeds provide fat to this dish. When these three macronutrients are eaten together they help ensure blood sugar levels remain stable and prolong fullness. To prevent excessive calorie intake it is important to be aware of portion control, especially when it comes to foods that are calorie dense. The recommended serving size of nuts and seeds is one ounce. However, very few people carry a food scale around with them making it difficult to measure out the correct portion. The recommendation that comes in response to the missing scales is one handful is equal to a serving size. But who's hand? Everyone's hands are different sizes. It turns out that most nuts and seeds weigh about the same and 1/4 cup by volume is equal to one ounce by weight. Individuals trying to gain body mass can be more liberal with their serving sizes but even people with weight loss goals benefit from including nuts and seeds in the diet. Their nutrient profile has proven to be adventitious in fat loss despite being a higher calorie food. This breakfast or snack is a wonderful way to include some of the best disease fighting warriors in the diet on a regular basis. Berries are at the top of the totem pole when it comes to nutrient density and their consumption has been linked with decreased rate of almost every chronic disease. Buy frozen berries and thaw them out as needed. You can even heat the fruit to make a naturally sweet syrup. My favorite combination is blueberries and walnuts. 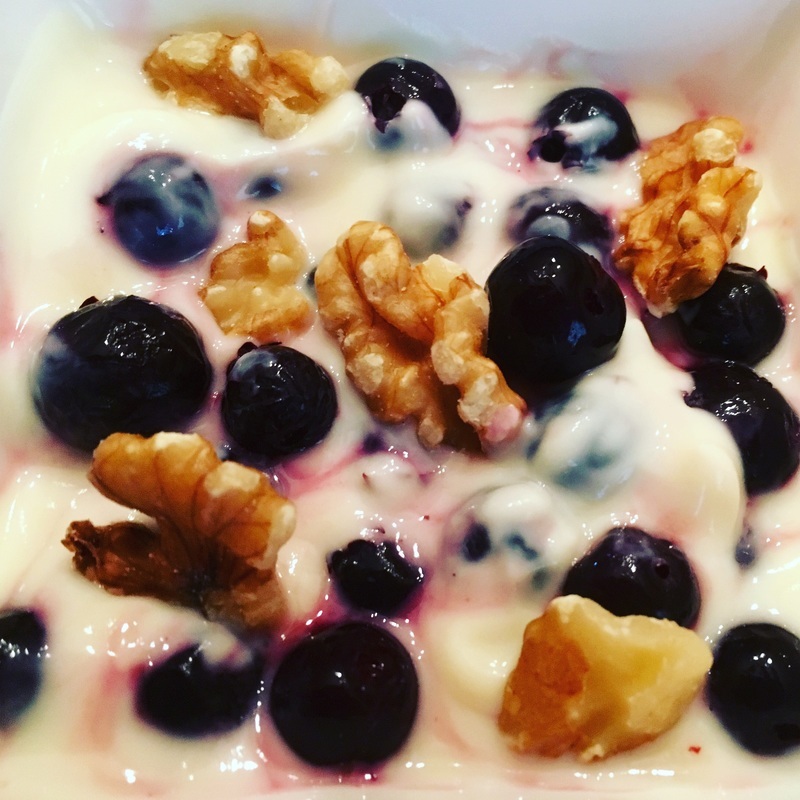 I like berries that don't have seeds that get stuck in my teeth and walnuts have the essential anti inflammatory omega 3 fatty alpha linolenic acid.